Recognise and use 8 points of a compass. Identify turns up to 1 revolution either as fraction of a turn (multiples of 1/8) or in degrees (multiples of 45°). Correctly use the terms acute, right, obtuse and reflex angle. Use the fact that angles on a line add up to 180°. Use the fact that angles at a point add up to 360°. Classify different types of triangle including scalene, isosceles and equilateral triangles. 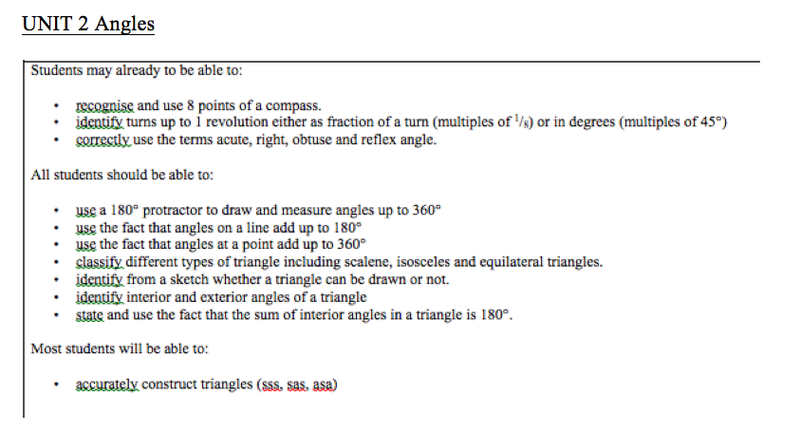 Identify interior and exterior angles of a triangle. State and use the fact that the sum of interior angles in a triangle is 180°. Accurately construct triangles (sss, sas, asa).